Several years ago I got a call from Mark Wexler. We used to refer to a call like that as a blast from the past. I hadn't talked with Mark since we both lived in New York in the Eighties. Back then, he was a photographer. Since then he had become a documentary filmmaker. He had already completed two films: "Me and My Matchmaker" and "Tell Them Who You Are." The latter is about his famous father, cinematographer Haskell Wexler. I had never known he was that Wexler's son. Mark invited me to meet him at the Sarasota Film Festival to see his latest documentary, "How to Live Forever." It's all about the fears (and joys) of growing old, which dovetails nicely with my creative late bloomer obsessions. The film is told in a wry and really engaging way. You don't expect to laugh when you go to a film about aging, but this one's a riot. Its cast of characters include the world's oldest woman, Phyllis Diller, a 94-year-old heart surgeon, Jack Lalane, a 92-year-old Japanese who dives for fish, Suzanne Somers who is touting hormones, a coffin maker and the people of Okinawa who are the longest living on earth. After seeing the film, I told Mark, "Everyone should see this film -- young and old." Now everyone can. It's finally available as a DVD on Amazon and iTunes. The DVD has 30 minutes of bonus material that I probably didn't see when I was down in Sarasota. Now I'll have to buy the DVD, too. Pretty clever of you, Mark. 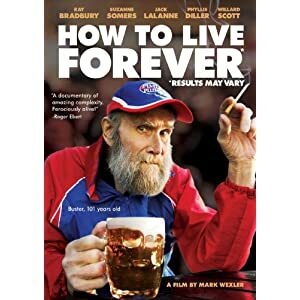 The release of the "How to Live Forever" DVD coincidentally comes in the same week as the death of Ray Bradbury who is one of the subjects in Mark's film. Of course, Bradbury, who was 91 when he died on June 5, long ago found a way to live forever: through his books. In the film, Bradbury, who was then 87, points out that he has written many books about old people, referring in particular to "Dandelion Wine," published in 1957. Then he talks about the sequel he just has written to that book which he says is again about the relationship between younger and older folk. This time though, he says, it's a conversation between his 13-year-old self and his older self. He compares the confrontation of these two Bradburys to Lee and Grant at Appomattox. Each has to learn to accept the other, he says. He doesn't name the book, but it turned out to be the last novel he released in his lifetime, published in 2006. It's called "Farewell Summer."